You can’t have a million-dollar dream and look, speak, and act like a classless act of jerkiness. If you want to grow your success and reach your potential, you must avoid making these 3 surprisingly common mistakes. You have less than 7 seconds to make an impression. That’s it. So every time you choose comfort and convenience over looking your best, you annihilate credibility at a colossal rate. When managing your personal image, convenience for you means conveniently giving great opportunities to others. Simply put, never leave your bedroom without dressing to the level of success you aspire to. Words are the verbal expression of your habits of thoughts. People who have negative thinking habits are often unaware how angry, sarcastic, and insensitive they sound. When confronted about their negativity, they defend it by attempting to rationa”lies” their bad behavior. Get a swift kick in the attitude by reading and applying these 11 guaranteed ways to develop a positive mindset that enables towering achievements. People are typically at their worst during conflict and disagreement, and the worst examples of these come from those who obsessively focus on finding fault as opposed to finding a solution. They consistently fight aggressively when receiving feedback (called “right fighting). And they efficiently make damning judgmental statements during verbal jousting. Life is about solving problems efficiently. The super-effective way to always act your best is to master the art of asking solution-focused questions – those that typically begin with “what” or “how”. If you want to know if you have any of these 3 all-too-common bad habits, ask someone whom you trust and will give you honest and candid feedback. You WILL NOT be able to change them by yourself because you don’t know they exist or how frequently you demonstrate them. To eliminate these requires a feedback process from people you trust (whom we call your SUCCESS team). We can also help by providing simple, easy-to-apply tailored coaching techniques. 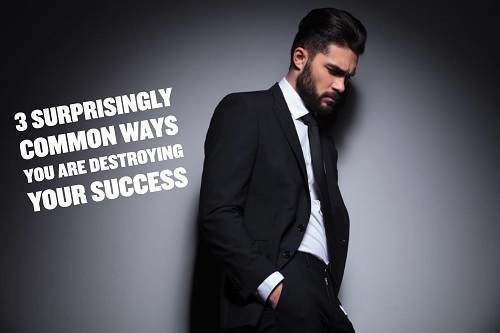 By eliminating these success-disabling habits you will get a boost in your ability to connect with people and experience a dramatic improvement in your most important relationships – those at work and at home. For more practical tips and strategies on becoming a person others love to be around, explore more of this website, subscribe to this blog, and follow me on social media (Twitter, LinkedIn, YouTube, Instagram, and Facebook). By doing so, you will have access to daily inspirational and motivational quotes that will drive your success trajectory upward. So don’t delay, follow me and think yourself to success today!